First, thank you guys SO much for all the support on yesterday’s post. It definitely was a little scary to press publish on that one since money is such a personal and touchy subject, but I almost felt like a fraud NOT addressing it since I talk so much about grocery budgeting and being a bargain shopper on here. I got a LOT of questions about budgeting, how I paid/am paying off my cards, and ways to save money through Twitter, the comments, and email, so I’m planning on doing a follow up post, probably next week. If you have any specific questions, feel free to reach out and I’m happy to share my experiences with you. Moving along… a new recipe! A good one, too. I’m almost embarrassed to admit that this recipe is inspired by Ruby Tuesday’s. When Wil and I were driving down to visit his mom this weekend, we pulled off the highway to get gas in the middle of nowhere and the options were Ruby Tuesday’s or Waffle House, so you can guess which one we went with. I rarely if ever eat at chains, but Ruby Tuesdays is one of my favorites because they have a great salad bar. There was a lunch special for zucchini sliders (with the salad bar) and I was shocked with how delicious they were! Ruby’s version had red pepper, zucchini, and feta, but they were a little greasy for my taste, so I stole their idea and made a healthified version for dinner last night, and wow. So good. This entire recipe as is has 10pts+ and you can find the printable version here. They can be divided however you want to into patties, but I recommend making at least 5 so they are thin enough to cook through because of the raw egg. 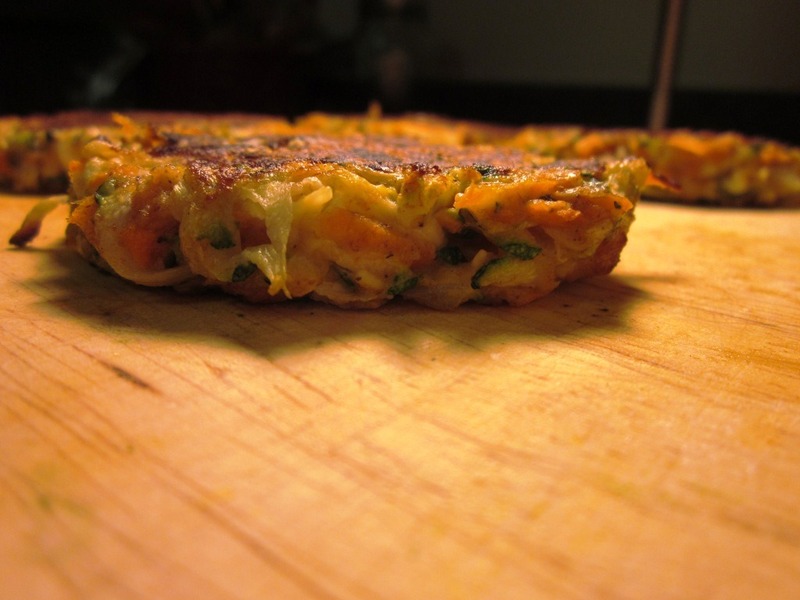 These zucchini burgers are super flavorful, moist, and delicious! 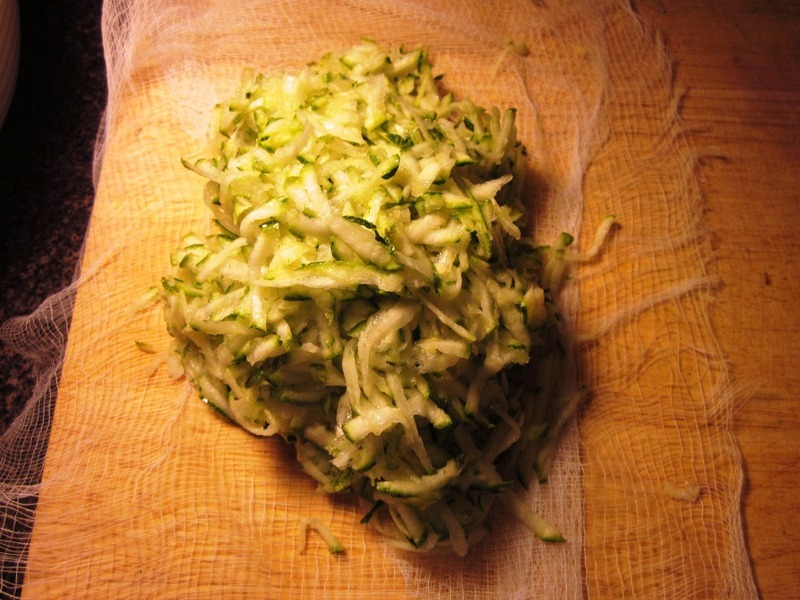 The first step is to grate up the zucchini. 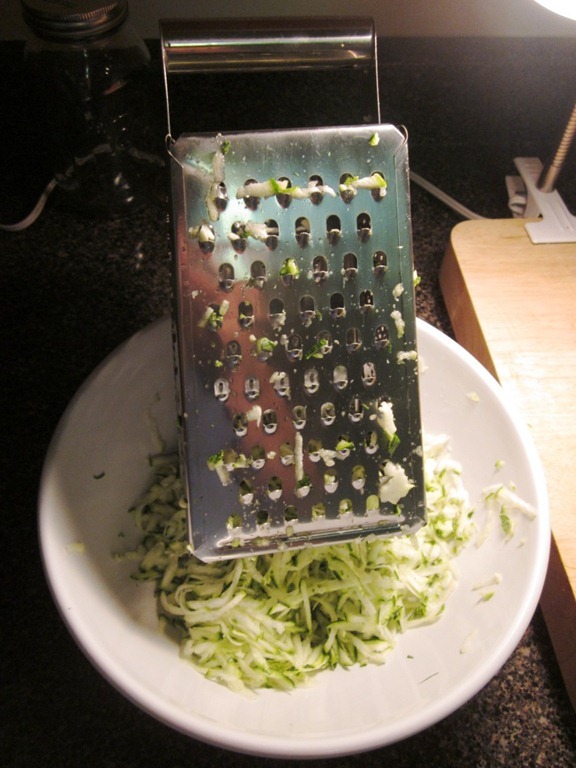 I used the large part of a grater to do this, but you can do it in a food processor also. 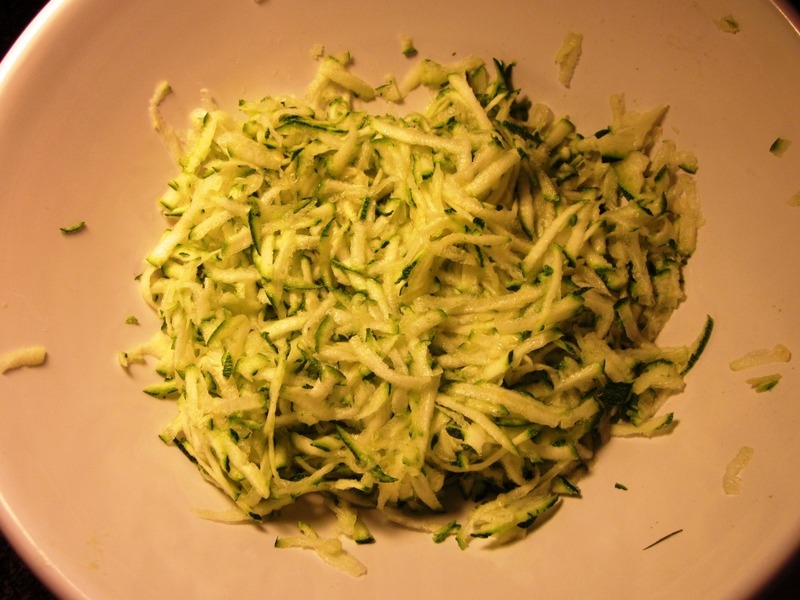 Now, add 1 tsp of salt to the zucchini mix and let it sit for about 5 minutes. 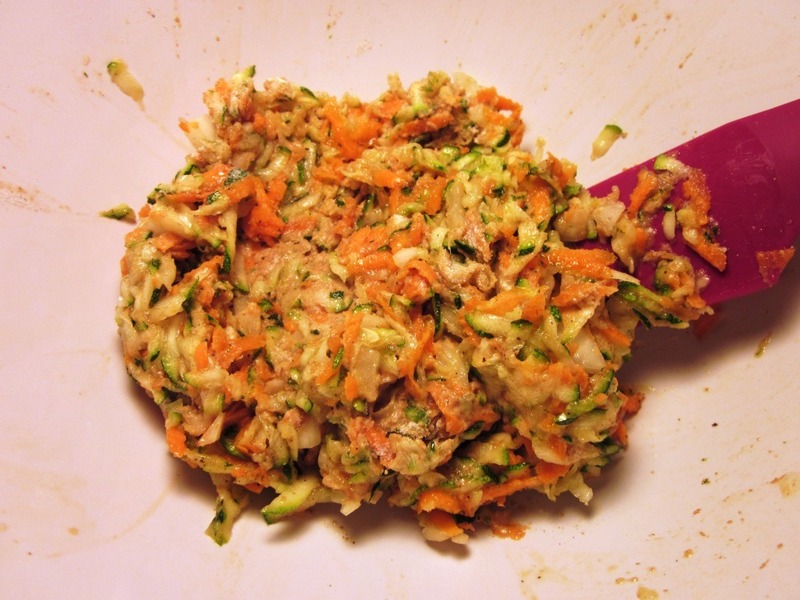 Go ahead and prep your other veggies while you’re letting it sit – chop up the onion finely and grate the carrot. And SQUEEZE. There will be tons of liquid coming out, so do it over and bowl and keep squeezing until liquid is no longer draining out. Almost 2/3 a cup! Crazy. 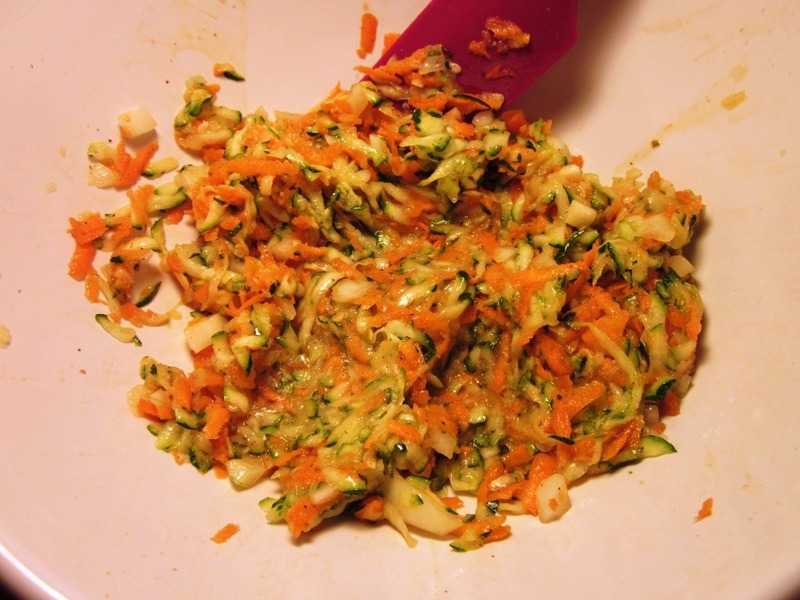 Now put the drained zucchini into a large bowl. 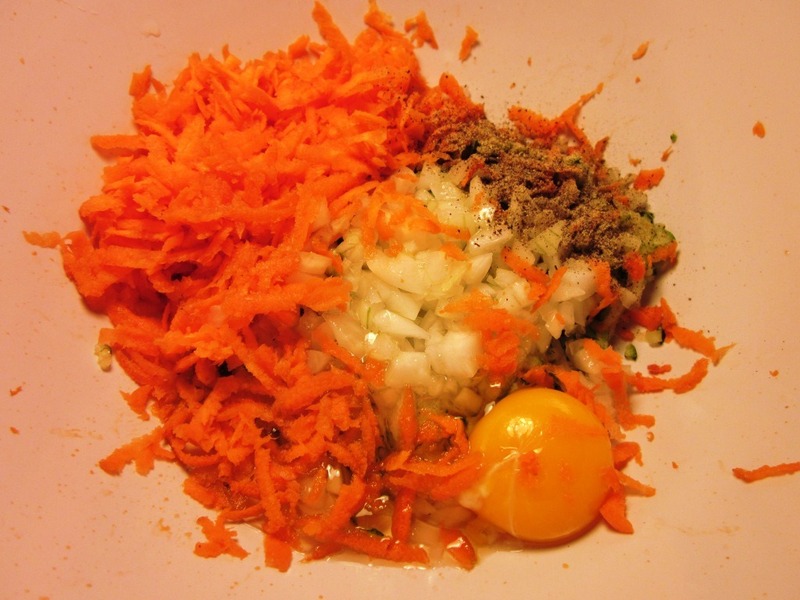 And add in 1 grated carrot, 1/3 cup diced onion (the smaller the better! ), 1 egg, and black pepper. Stir to combine the mixture, making sure everything is spread around evenly. Add in 1/4 cup whole wheat flour. And stir again until the flour is well spread throughout the mixture. Last step, add in 1/4 cup crumbled feta cheese. 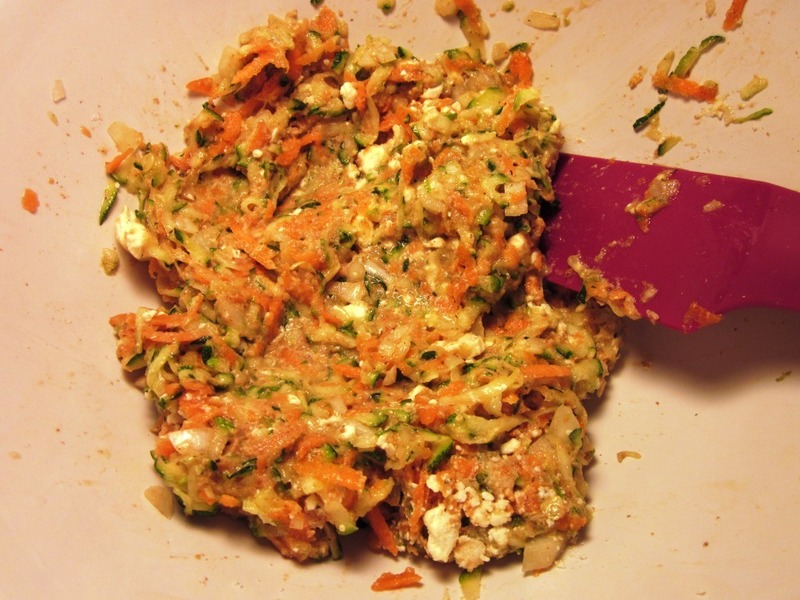 And gently fold the feta into the mixture until its spread relatively evenly throughout. Now, time to cook! Heat up a large skillet, and spray with nonstick spray. You can also cook these in oil, but I just went with spray and it worked great. 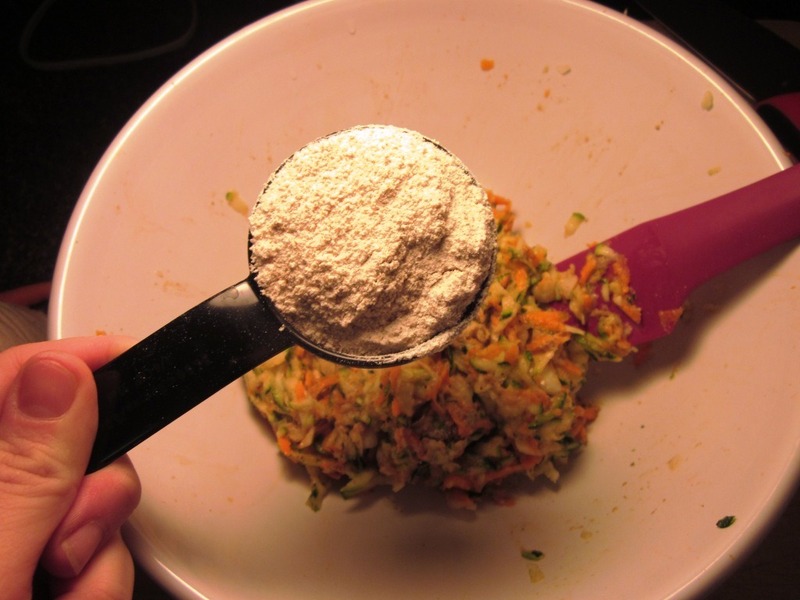 Using your hands or an ice cream scoop or spoon, place rounds of the mixture on the heated pan. 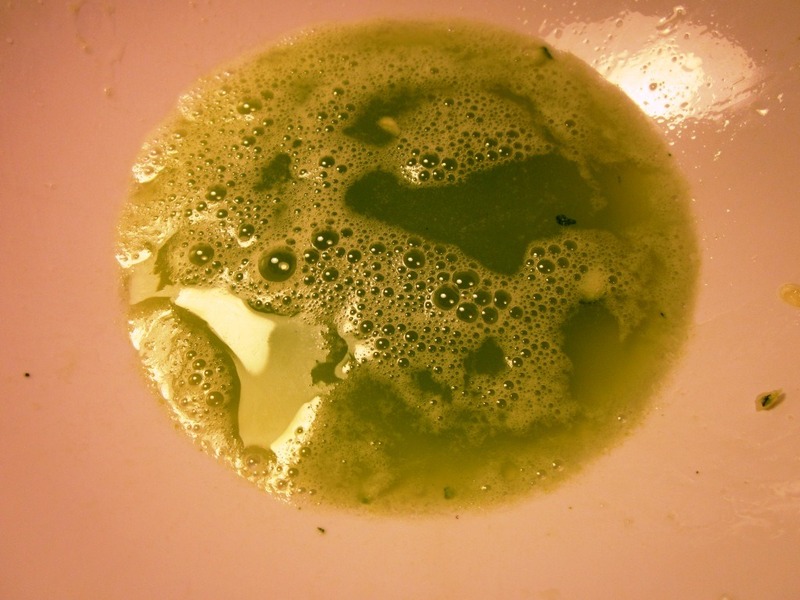 The mixture will be wet – don’t worry! It’ll hold together just fine. Cook about 4-5 minutes, and the flip! Cook another 4-5 minutes, and then remove from the heat. I think my lighting was messed up because these look a little burnt in the photos, but they really were perfect! They are very moist, flavorful, and stayed together really well. The texture is crunchy on the outside, and soft on he inside. They are loaded with veggies, packed with flavor, and absolutely delicious. They taste quite indulgent, but are super healthy – my favorite combo! You can serve these patties on hamburger buns, english muffins, pita, over salad, or eat them straight up like I did. 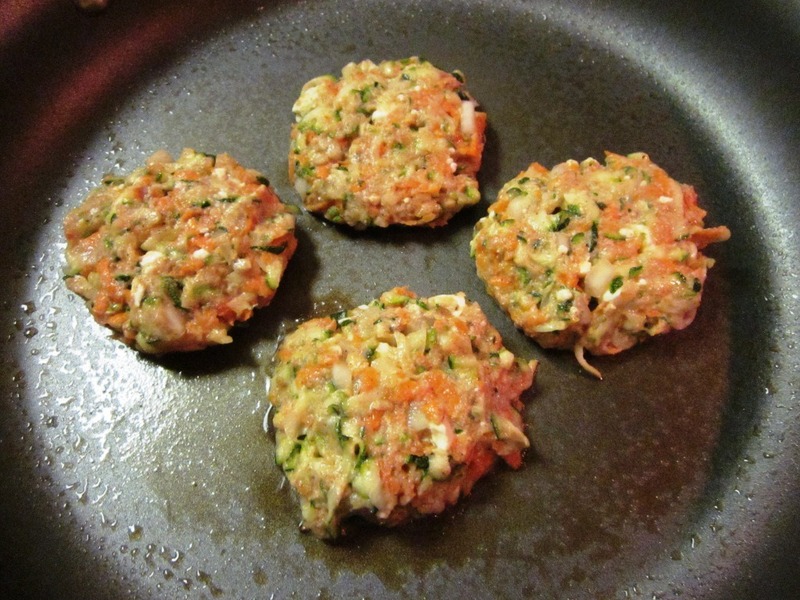 You can also experiment with your mix ins for the zucchini burgers. Rubys version had red pepper (I’m not sure if they were roasted or raw) which I wolud have added if I had some on hand, but you can also change up the other veggies in here based on what you have. Enjoy! Do you eat at chain restaurants? What’s your favorite one? After I wrote this I remembered that though I love the salad bar at Ruby Tuesday’s, The Cheesecake Factory is actually my favorite! Really hard to eat there healthy but the food is just so good.. and the cheesecake. I also love Subway and Chipotle, but I don’t know if those count. This recipe sounds great, I will probably try it next week. I eat out at Outback a bunch. I usually get the 6 oz Outback special ($9.99) :6oz steak (cooked w/out butter) and double order of steamed veggies (cooked w/out butter). I think these look delicious! Do you think they’d hold up without the feta if I add some bread crumbs? Ruby Tuesday is one of my favorite chain places to eat – we usually go there, Panera or Chipotle. Hey Holly! I’m sure they’d work with breadcrumbs. You might have to season it a bit more since the feta adds some salt if you make them without. They were so good I ended up eating them all! Ha. Those look delicious! I can’t wait for zucchini be everywhere this summer so I can try them. My favorite chains are: chop’t and CPK. These look awesome! I’m going to try them next week :). I really hate eating at chain restaurants (especially because there are so many not chain restaurants in my town) but a friend of mine insists on going to chain restaurants when we go out to dinner, and of all of them I prefer Applebees. I feel like you can get a reasonable calorie dish there that tastes pretty good with their uner 550 menu. You just have to abstain from salt for the rest of your life! haha love the salt comment. I haven’t been to an Applebee’s in YEARS, but they did used to have a menu with points values on it so I liked that. For your next birthday/major holiday, you NEED a food processor. It’ll make the process of making things like this a breeze. I love veggie burgers like this that *actually* have veggies in them. A refurbished KitchenAid 11 cup is $100. Totally a reasonable ask if people go in together. They sound delish! Makes me think of a latke! I hate American food chain restaurants (99, Applebees, Ruby Tuesdays, etc) but I LOVE italian chain restaurants like the Olive Garden and Bertuccis…”americanized” italian but so delicious! 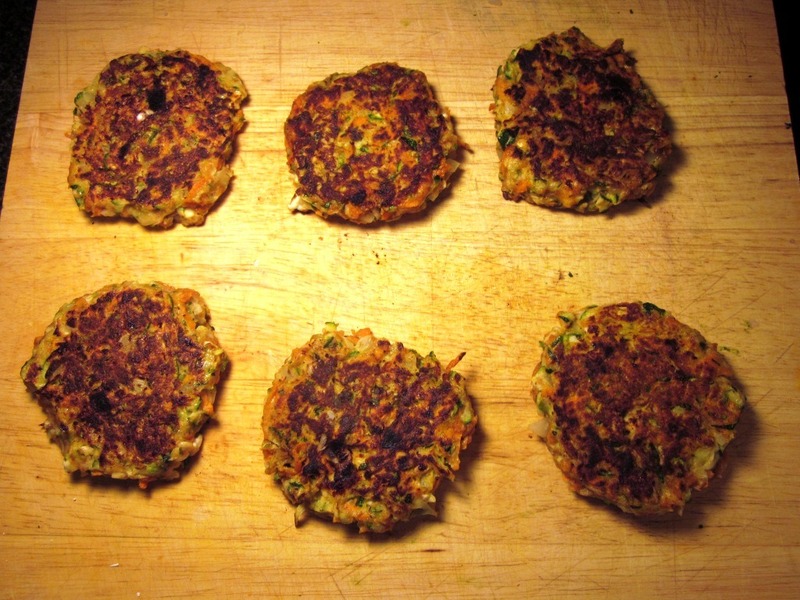 Those zucchini burgers look amazing! Beth, those burgers look amazing!! Thanks for showing step-by-step photos. This is awesome!!!! 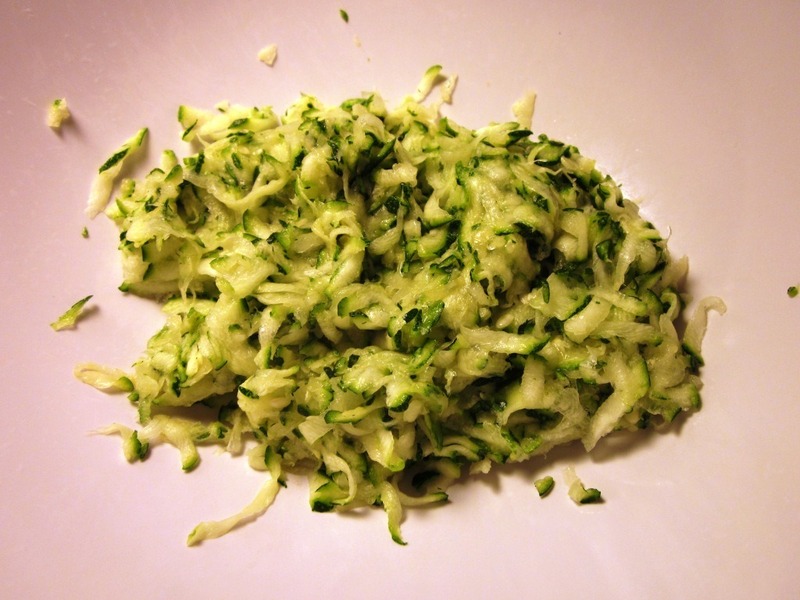 I love zucchini’s and am really looking for more meatless meals. I will totally be trying this! Those zucchini sliders look amazing and appetizing.. I will try making them this weekend. Is the wheat flour used to bind everything together? Hi Nina! It does bind it together and also makes the texture a little more cakey. You could probably make it without but I’d use bread crumbs in that case to help soak up some of the moisture from the veggies. These look delicious! I bet the points plus value for them is pretty low, too. 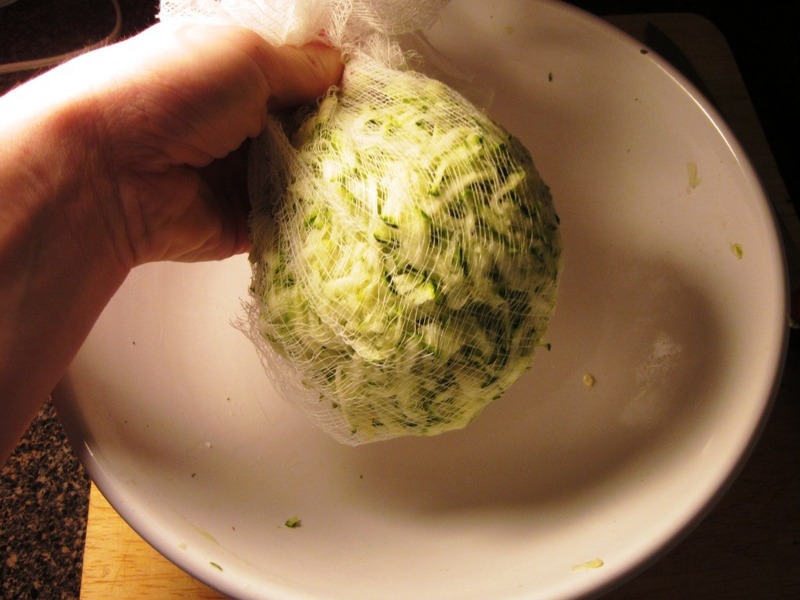 I absolutely hate draining zucchini (it sticks to my hands and everything else), so I’ll have to try out the cheesecloth! I make something similar to this and it’s amazing! I love it! I’ve never added feta though, so I really want to try this! that looks really delicious! also could be breakfast for dinner, like a zucchini cake. yum! so they are just 2 pts each? that’s awesome! sounds yummy. I’m going to try it with some frozen zucchini that I need to use up. We’ve got tons of zucchini growing in our garden right now and I’ve been looking for some new recipes. Can’t wait to try this. Hi Beth, these look yummy, but HOLY SMOKES, that’s a lotta liquid!!!!! Crazy. Have a great day. I know I was SHOCKED with the amount that came out from the one zucchini!! While I don’t love chain restaurants I usually end up at them because they are more likely to have gluten free menus. I’d say Outback or Red Lobster are my favorites. I do like the Ruby Tuesday salad bar though but those croutons taunt me! lol! You recipe looks delicious. I gotta try that! 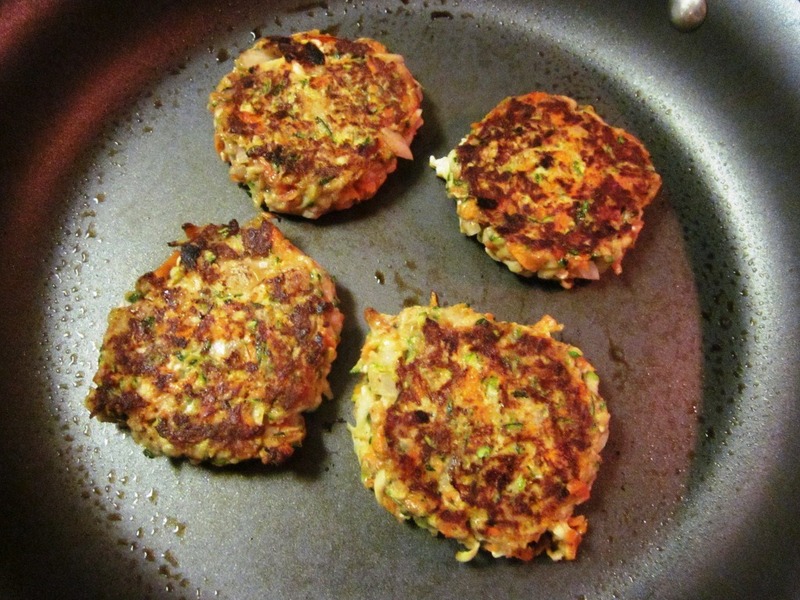 oooh I love zucchini burgers and these look wonderful! I just had these at Ruby’s the other night. Not too bad! I’m with you on the whole avoiding chains for the most part as well. But, yeah, their Salad Bar is AWESOME! I may have to try your recipe soon. I love Ruby Tuesday’s, the salad bar is my favorite! because i saw these on your blog, i made them for dinner last night. the zucchini from my CSA has been so delicious and this was a great use. instead of carrot, onion and feta, i added a couple slices of turkey bacon and some baby portabellos which i diced and cooked before adding to the raw zucchini. i am going to try making them with goat cheese next. Oh yay so glad you tried them! Zucchini is plentiful right now and I love how recipes like this are totally customizable to your mood/what’s in your kitchen! totally. plus my bf is not a vegetarian so i wanted to serve him somethign healthy that he wouldnt call rabbit food. 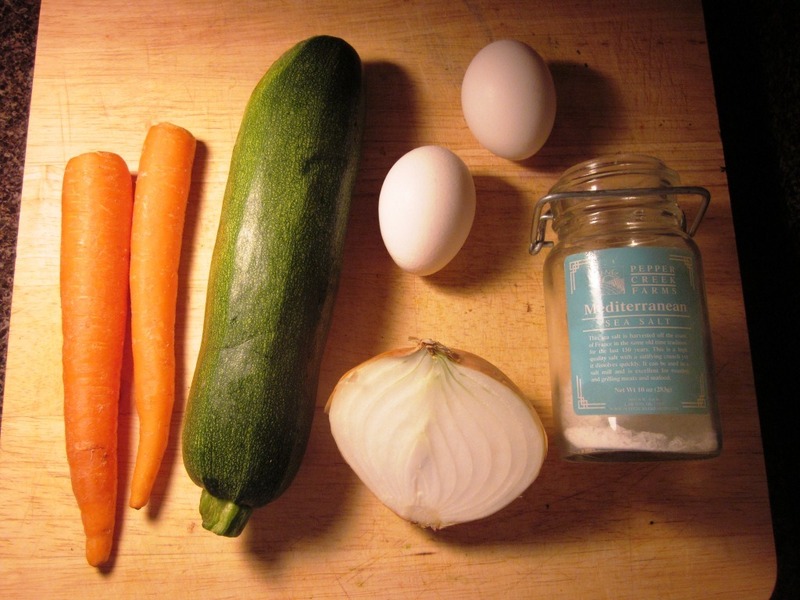 i only had about 3/4 of one large zucchini so i added only one (farmers market) egg. because the mushrooms were still a bit moist they did not cook up like burgers but more like moist zucchini pancakes, so i will play with the ratios, but they are good as pancakes too! These look soooo yummy! I would probably add some Trader Joe’s tzatziki sauce on top too! Thanks for the healthy recipe! Ohh that’s a great idea! I was also thinking greek yogurt mixed with a little feta and herbs, or else plain old ketchup! I just made these and they changed my life! haha 😀 So delicious. I like things spicy so I added a little cayanne pepper and crushed red pepper flakes! So good!!! This will be a new staple recipe! Oh man. Just made these for dinner and they were out of this world! Seriously, so, so delicious. Can’t wait for leftovers tomorrow! I ate at Ruby Tuesday’s on Mother’s Day and ordered the zucchini sliders. I was determined to find a recipe online so I could make them myself because they were so good. I loved your recipe. I made a few small substitutions as I didn’t have any carrots so I used some broccoli slaw, added some garlic and since I’m gluten free i used rice flour. They turned out great. I am excited to now do some experimenting with different flavors! hi beth! i read your blog everyday and love it! I’ve had these bookmarked since you posted them and finally tried them today!!! I have to say they are AMAZING 😀 definitely worth the annoying grating part haha thanks for the great (and new favorite) recipe! I finally tried these! I made them for lunch today. HOLY YUMMINESSSSS!!!!!!! Thanks for sharing such gret recipes! Beth, I just had these tonight for dinner and they were yummy! I subsitutued the feta cheese with some goat cheese but any cheese I am sure would be good. Cheese makes everything better! Aww yay so glad you tried them!! I love the idea of goat cheese in them.. yum! I just had Ruby Tuesday’s version and was wanting some more. Thanks for the idea!!! Loved these!!!!! I serves them just as is and topped them w/ a touch of horseradish. I used an orange pepper in mine. Just added raw, but roasting it might be called for next time. Any substitutes for the Feta. I rarely have Feta, would pepper jack work? I bet pepperjack WOULD work if you chop it into tiny bits! 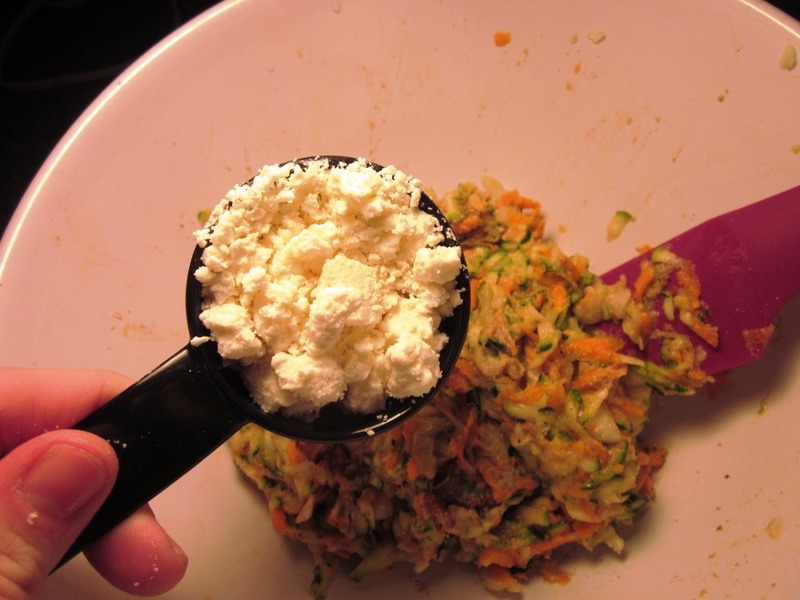 You could also try goat cheese, blue cheese, or any other crumbled kind of cheese. They are SO good! I just found your site doing a search for “zucchini sliders.” Then I saw that you have lots of other recipes! Thank you! 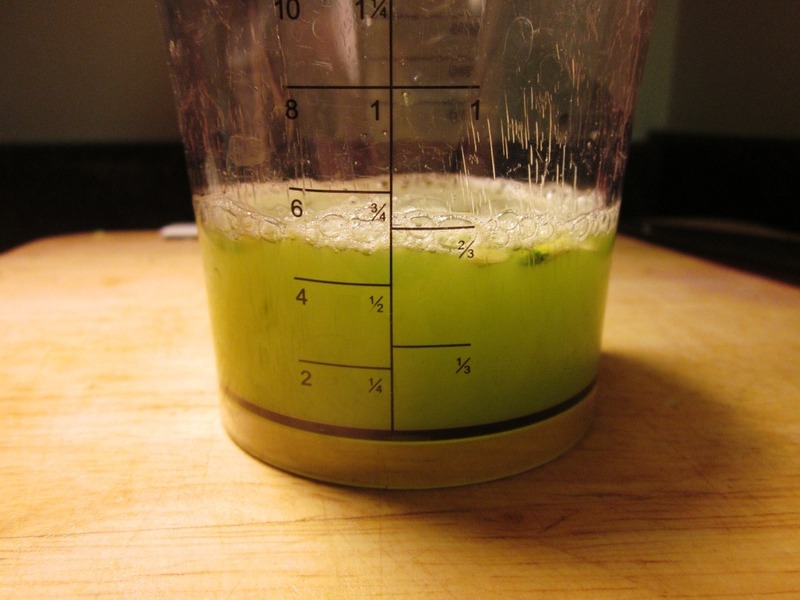 Great recipe…If anyone has a Jack La Lane juicer or similar…they work great to shred the zucchini and get the juices out…Thanks for the recipe! Do you know how many points per serving these would be using the old weight watchers system? Since I’m a lazy cook and have a garden full of zucchini right now I doubled the recipe, froze the patties and they heat up well!! Great recipe and instructions. I am addicted to a zucchini bake and it’s not the healthiest use of veggies so this was a great find! i actually add a bit of my basil paste (basil, garlic, olive oil) to the eggs. 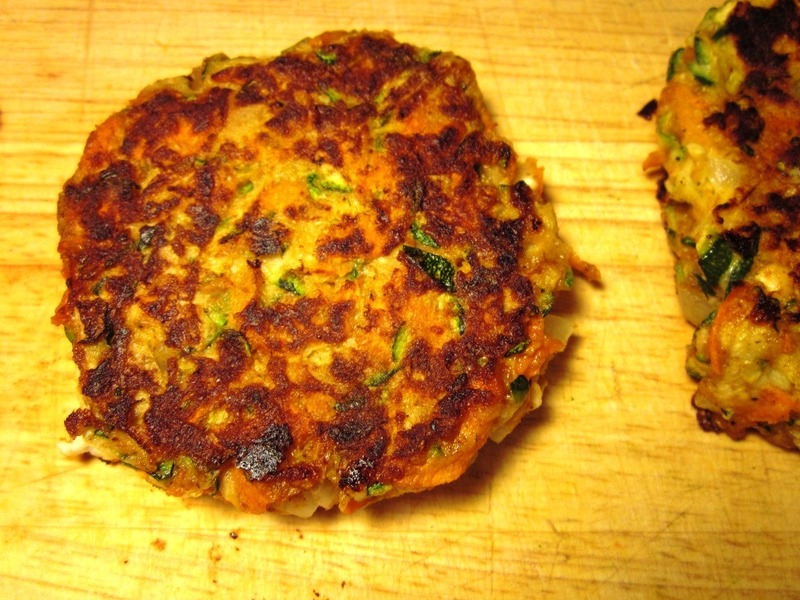 i have so much garden zucchini that i have loads of these burgers in my freezer. NOTE: freeze the cooked burgers first and then vacuum seal them. i tried your recipe tonight, the burgers are awesome!! i didnt dry the zucchini enough, so i ended up adding an extra tbsp of flour to make them bind.. also added some lemon rind.. and they’re great!! These look fantastic! Do you have any idea what the nutrition content is like? Had these at ruby’s last week and was just about to recreate them myself when I can across your recipe. I think I’m going to add a little garlic. Thanks for your post! I had these yesterday after a long morning of jury duty indoctrination (wasn’t chosen 🙁 There were very good! I was glad to see the recipe on lone – thank you! I spoke with one of the chef’s at Ruby Tuesday’s. He said they used the same kind of breadcrumbs they use for their crab cakes. So, I think they must be flavored with some kind of bay seasoning or similar. And that they used jarred roasted red peppers, too, in the mixture. I love your recipe, and find them addicting. Love them a lot! Thanks for your help. I’ve dropped out of WW – will devote the next year to more movement, exercise in water, etc. I’ll do what I can for a 63 yr old, with bad knees and varicose veins. Thank you so much for making this recipe. Ruby’s Tuesdays Zucchini Sliders are my very favorite and I’ve been thinking of trying to make them for some time but I’m sure your recipe will be terrific. Trying it now! Excellent recipe! My buddy and I used this for a sustainable foods cookoff, and slightly modified the portions to make 40(ish) sliders. After finishing the patties, we spread a little hummus on top of each one and wrapped them in lettuce leaves. They turned out delicious and sparked a lot of interest at the event. Thanks for the idea! I used my Breville panini press to cook them. Both sides are evenly cooked in 5 minutes without any oil or spray. Just make sure to set the height adjustment so that you don’t squash the patties too much. Hi Beth – I went to Ruby Tuesdays tonight and tried the zucchini burgers. They were soooo good. I removed the bun and ate them plain. So, when I got home I googled zucchini burgers and went thru some recipes until I found one like Ruby Tuesdays had. When I found your recipe, I couldn’t believe it – it was the recipe I was looking for. They didn’t have the carrot in it. They had red pepper. I think they must have saute them first. I would cut it really tiny so you don’t have to pre-cook them but I want to try it with the carrot. I’m going to make these tomorrow as they are delicious. I don’t really care for feta cheese but in these burgers it really complimented the flavor. Hey Beth, I made these last night and used green onion instead of white, also added some garlic as I am incapable of cooking without it. They were very good and even better today for lunch. Going to try more of your recipes. Thanks so much. These are amazing! I have been making them at least a couple times a week for the past month and they are a huge hit with my family. The second time I made them, my husband insisted I make a double batch. For the two of us! I have made them two ways so far- once to your recipe and the other gluten free, which I thought some others may find valuable. Instead of the flour, I used scant 1/4 cup of finely ground rice crackers plus half a tablespoon of almond flour. My mom is gluten free and that is what she had on hand in her house to work with. They turned out perfectly- no flavor difference at all. Thanks for a terrific healthy recipe, Beth! Thanks for sharing Holly! Glad you are enjoying them so much! I have a plethora of zucchini right now and was running out of recipes until I found this one!!! It was DELICIOUS, AMAZING, FANTASTIC! They tasted sooooo good, my boyfriend and I ate them all and he’s not even vegetarian. I added walnuts and a little cumin. Man ! I will make these weekly (at least) from now on!!! THank you!!!!! Stupid good! Hahah. Glad you enjoyed – and with cheese on top? Yum! do you think if I made this recipe and cooked it in the oven it could double for “meat”loaf? Hi Emily! I’m honestly not sure. The texture might be off, but you could give it a try (and let me know how it goes!). I’ve found lentils or tempeh to be the two best “meat” replacers. Just made these! Absolutely in love with them! UNBELIEVABLY GOOD! I tried this recipe two nights (adding roasted mini peppers, and doubling the carrot and egg) and loved it so much that I made them again last night. Requires a little bit of elbow grease for the grating but so worth it! Thanks for sharing! delicious!!! Gonna try this weekend for sure. First I want to thank you for creating a copy cat of the zucchini sliders because I absolutely love them! I have just one question, can the red pepper easily be substituted for the carrot? I really really like the flavor of the red pepper and feta together. I replaced the flour with steel cut oats( ground with a food processor) since I’m staying away from gluten, and I didn’t have feta so I put some cheddar in there… They turned out amazing, but it didn’t stop there, we decided to make them into lettuce wraps instead of the bun and made a sauce to go on top.